This year Big Hair went through a rebranding and I'm here for it. Don't get me wrong, I loved the old packaging but this new cleaner, monochrome and somewhat clinical design is giving me scandi skincare vibes, which is just what I want on display in my bathroom. I was discussing this the other day with Melissa in fact and saying, I think a lot of brands forget that these products will most likely be on show in the shower or corner of the bath and no offence but who wants fluorescent green bottles or brown tubs on display? Not me. Before now, this is the only Big Hair product I had tried. I was gifted a pot years ago at an event and went on to purchase another once it finished. The mask is an incredible conditioning treatment but what I love the most about it is the smell. The ingredient list includes cocoa butter & banana and the product looks and smells like a chocolate banana cake mix. I really have to stop myself from getting a spoon out and digging in. I'm really particular with smells and can't stand artificial scents, so this is a real plus for me. My hair is constantly soaking in deep conditioner, I actually deep condition for around 3 days each week at the moment as I'm nursing my hair back to health. This mask is the big dog that I pull out when I want an intense treatment rather than plonking it in my hair and leaving it in until I can be bothered to wash it out sometime that week. This is mainly because of the natural ingredients raw ingredients, I don't think they'll do well sitting in my hair for that long. I would say if you're looking to add moisture back into dull and dry curls, you should bye this now! I did the porosity test last year and learned that my hair is low porosity which means my hair is resistant in receiving water and moisture. After learning this I've focused my products around ingredients that work to penetrate the strands, giving moisture, but not weighing it down. 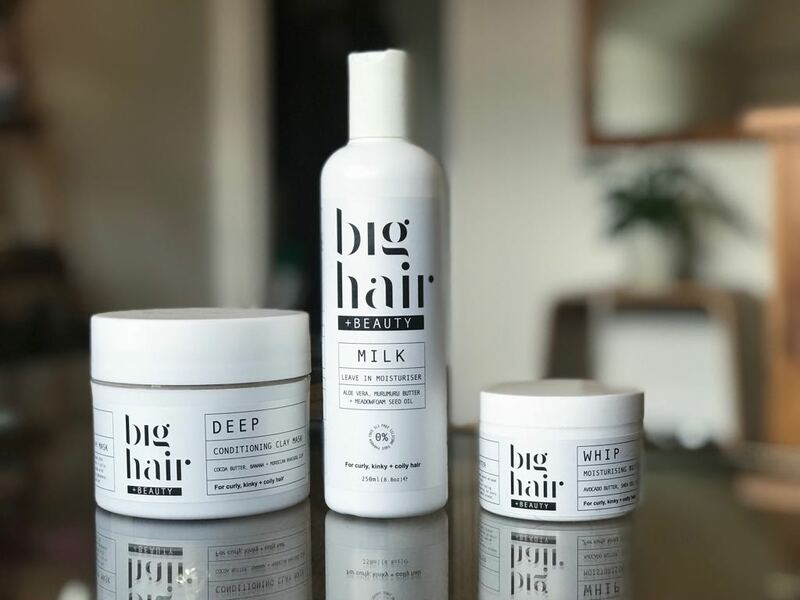 The Big Hair Milk is really lightweight and even after using it as a refresher over a few days, doesn't leave my hair heavy but definitely gives it the moisture it needs. I really like this product and I think my hair is enjoying the Aloe Vera, butter and oils combination. A gorgeous whipped butter that again worryingly looks and smells like something you can eat. My hair has been extremely dry of late so I decided to use a small amount of this beauty pre-braiding. My braider actually commented on how soft my hair felt when she was doing my hair, which is funny because before deep conditioning and using this product, it was so dry. What I like about this product is that it's a butter but it's not too heavy and doesn't feel like it's sitting on my hair. I find a lot of butters thick and weighing, but this product soaks into the hair nicely. When using this I've focused on ends of my hair as they need the most attention. Head to bighair.co.uk to shop more of the range! Let me know what you're using and how, always good to share and compare hair routines.